No one is ever going to mistake either of the Daddy's Home movies for great filmmaking. 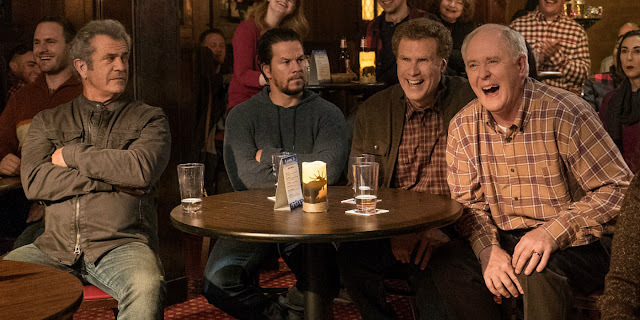 The first was a rather rote, if occasionally amusing, slapstick comedy about a mild-mannered stepdad (Will Farrell) learning to coexist with the tough-guy biological father of his stepchildren (Mark Wahlberg). It wasn't a major hit, so a the prospect of a sequel was something of a surprise, not to mention somewhat unnecessary. But in the end it manages to justify its own existence, and even provides a few laughs along the way. 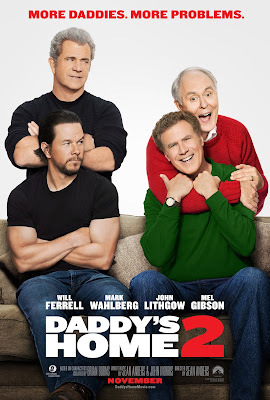 Daddy's Home 2 reintroduces us to Farrell's Brad and Wahlberg's Dusty, now happy "co-dads" who are running their united families like a well-oiled machine. However, with Christmas approaching, they discover that their children are actually unhappy with having to split the holiday between the two families. So they plan a "together Christmas" to include both families at once. But things get a little complicated when Brad and Dusty receive word that their own fathers are coming to visit. Brad's dad (John Lithgow) is an effervescent, effeminate motormouth much like his son, while Dusty's dad (Mel Gibson) is a hyper-masculine lady's man with no tolerance for nonsense. At polar ends of the spectrum much like their sons, the duelling grandpas are about to make Christmas a holiday the families won't soon forget, forcing Dusty and Brad to confront old wounds and disrupting the tenuous bonds of their newly formed alliance. Daddy's Home 2 is a marked improvement on its predecessor, mostly thanks to the presence of Gibson and Lithgow, who gamely dive into the film's silliness. It retain's some of the original film's over-the-top slapstick, but wisely scales it back, focusing instead on more character-driven comedy courtesy of its almost overqualified cast (a bit involving the dads' obsession with keeping the thermostat turned is especially inspired). The script is still a problem, throwing in contemporary buzzwords like "snowflake" in at awkward attempt at being cool, but instead comes across like a lame dad trying to impress the kids with some slang he just heard. Like most comedies, it's hit or miss. Some jokes land, others don't, but Daddy's Home 2 coasts by on a modicum of charm and a capable cast. Gibson and Lithgow make terrific foils for Farrell and Wahlberg, and their presence provides a major boost for an otherwise mid-grade comedy. It's a rare comedy sequel that actually surpasses the original (although the original wasn't particularly great in the first place), and expands on its premise just enough to make this a world worth revisiting. DADDY'S HOME 2 | Directed by Sean Anders | Stars Will Farrell, Mark Wahlberg, Linda Cardellini, John Lithgow, Mel Gibson, John Cena | Rated PG-13 for suggestive material and some language | Opens Friday, Nov. 10, in theaters everywhere.